The business case for a northern bypass in Ipswich could be put to government this year, it has been revealed. Suffolk County Council will launch a consultation this summer to gauge public support for the road, and identify the preferred route. Leader Matthew Hicks said: "A project of this scale can only proceed by ensuring all partners are fully committed to each stage." Work in 2017 identified three possible routes to connect the A14 and the A12. The three potential routes connecting the A14 to the A12 were: an 'inner' corridor from Claydon to Martlesham; a 'middle' corridor from Claydon to Woodbridge; or an 'outer' corridor from Needham Market to Melton. County, district and borough councils have all agreed how plans should progress, with consultation results due in the autumn, said the Local Democracy Reporting Service. "I'm committed to keeping residents and businesses informed as we progress through the next steps," said Mr Hicks. 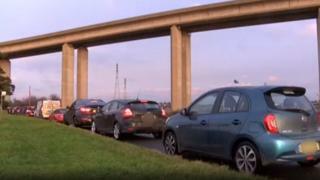 A northern bypass for Ipswich - which could be single or dual carriageway - has been discussed for many years, with supporters saying it would relieve congestion in Ipswich, particularly when the Orwell Bridge is closed. The government has said that in order to attract funding the road would need to unlock housing growth north of Ipswich, rather than solely solve town traffic issues. Details of the business case had been expected by the end of 2018, but have only just been released as work was delayed. On a visit to Ipswich in April, transport secretary Chris Grayling said there was "no doubt" that improvements "had to happen" in the town, but fell short of committing to a northern route.